Azure Application Insights provides powerful search capabilities to query and get insights from your telemetry data. Often, you may find yourself running the same queries repeatedly to validate whether your service is functioning properly or to find trends and anomalies. Wouldn’t it be nice to turn the repetitive queries into your own workflows so you can save time and turn those insights into actions? 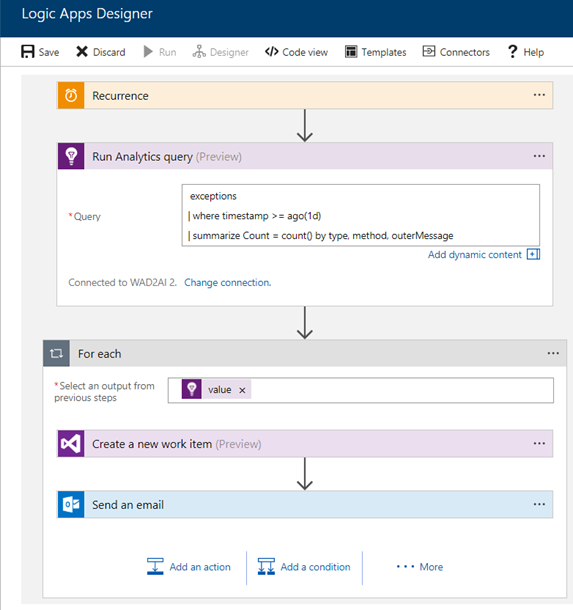 Well, this is now possible using the Application Insights connector for Microsoft Flow and Azure Logic Apps, as it will allow you to create automated workflows visually. Using the Application Insights connector, now in preview, you can create workflows that use an Application Insights action to query or visualize your telemetry data. You can have them run together automatically along with any other subsequent actions you choose. There are hundreds of available actions, such as sending an email notification, creating a bug in Visual Studio Team Services, or posting a message in Slack or Microsoft Teams. Below is a sample screenshot of the Microsoft Flow integration. Below is a sample screenshot of the Azure Logic Apps integration. 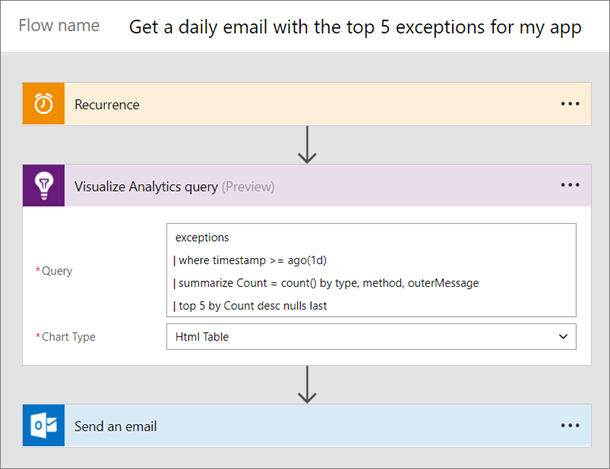 Learn more about how to automate Azure Application Insights processes with the connector for Microsoft Flow or Azure Logic Apps. Try today and share your feedback at aiflowfb@microsoft.com.